Using a mobile app or voice controls isn't always the most practical solution to turning on your Philips Hue bulbs. 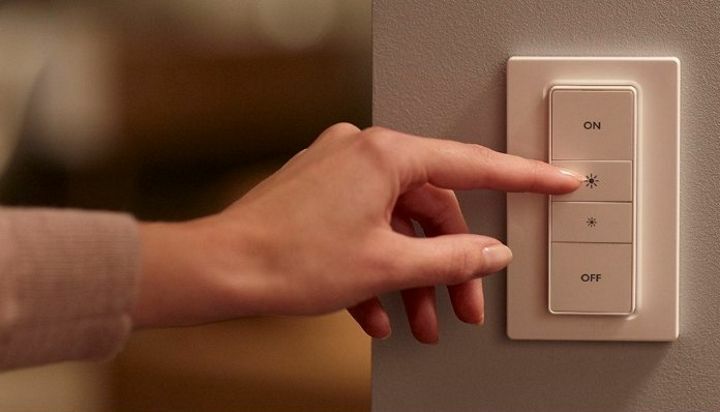 Instead, why not go for the official Philips Hue Dimmer Switch? And why not get one of the best Philips Hue Dimmer Switch deals available during the Black Friday 2018 sales? This versatile light switch can work as a traditional on/off switch, but can also brighten/dim your Philips Hue bulbs. The removable remote-control switch comes with a docking station that can be stuck to your wall via the adhesive backing, or screwed in. Unlike regular light switches though, there's no drilling into walls to connect to your mains power supply, instead it's powered via a battery. Being able to take the switch out means you can put it anywhere you like, be it on the coffee table, by the front door, in the hallway, wherever suits your needs best. Unlike most Philips Hue products, you don't need a Philips Hue Bridge to use these smart functions. So you can buy a Philips hue bulb and turn it on and off while using the dimmable lighting features without spending anything extra. That said, if you want to change the warm and cool 'temperatures' of a White Ambiance bulb or change the colour of a Colour Ambiance bulb, you will need one. Take a look at our Philips Hue Starter Kit page for more information there. To us, the Philips Hue Dimmer Switch is a great addition to the Hue family, but more as an addition to an existing setup rather than a starting point. That's mainly because the best part of using Philips Hue lighting is the enhanced features of adjusting the temperatures of white light or the wide range of colours to choose from with the top-tier bulbs and for that you'll need a Hue Bridge to control the bulbs via the app.